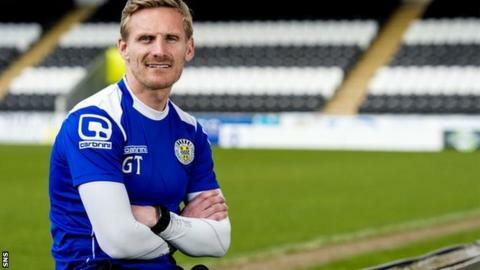 Gary Teale has urged St Mirren's board to make a decision on whether he will remain manager next season. The Buddies lie bottom of the Scottish Premiership and will be relegated if Motherwell beat Kilmarnock on Friday. "I've not spoken to them regarding my future," 36-year-old Teale, who took over when Tommy Craig was sacked in December, told BBC Scotland. "We speak week-in, week-out about different things and I would like a wee bit of clarity." Former Derby County, Wigan Athletic and Scotland winger Teale initially took over as caretaker player-manager before being told he had the job until the end of the season. "Obviously, I would like the job going forward and I think I've got ideas to help us improve as a squad and as a club," he said. "But I've not had the conversation as if that's going to be happening or it's not. "So I just need to carry on and do the best I can at this moment." Relegation would end the Paisley club's nine-year stay in Scotland's top-flight and Teale is keen to start the rebuilding process. "There will be a lot of different players coming out of contract at different clubs and to help the club going forward we are going to have to build a squad here," he said. "One or two might have to leave here as well, so you would like to get that done as early as possible to give you the best chance of getting a good pre-season under your belt before looking to do something next year." St Mirren have suffered 14 defeats during Teale's 20 matches in charge. However, he cites the January sale of Kenny McLean to Aberdeen and an injury to another key midfielder, John McGinn, who was injured by a training pole, as one of a number of unforeseen problems that have hampered his tenure. "I know it sounds like I'm making excuses, but I've had to deal with things that you would never expect to happen in my short time as a manager," he said. "We've had the freak training ground accident with John. Players can get injured, but to lose him in the way we did was incredible. "We've also had to deal with the loss of Kenny McLean to Aberdeen and some poor refereeing decisions that have gone against us, so it's not been an easy six months in charge. "But I've loved every minute of it. It hasn't put me off management. I hope I become a better manager for it."